Grandma's easy chocolate fudge recipes are amazing! You'll enjoy trying them. Why not plan an old time candy-making party this weekend? Get the entire family involved and see which one you like the best. Myself, I love 'em all! 2 cups fruit sugar, 1/2 cake unsweetened chocolate, small pinch of salt, butter size of walnut. Mix above together, then moisten with milk. Add a pinch of cream of tartar to make it light and foamy. Let boil until the soft ball stage. Then remove from fire and beat. One-third cake of chocolate may be used, depending on one's taste. Two squares of chocolate, two cups of sugar, three-quarters of a cup of milk, butter size of an egg. Cook until it forms a soft ball in cold water. When done beat well, and add one tablespoonful of vanilla. Stir constantly and pour into battered pan to cool. 2 squares unsweetened chocolate, 2 cups sugar, 2/3 cup of milk, 1/4 teaspoon salt, 2 tablespoons butter, 1 teaspoon vanilla. Add chocolate to milk and place over slow fire. Cook until mixture is smooth and blended, stirring constantly. Add sugar and salt and stir until sugar is dissolved and mixture boils. Continue cooking without stirring until a small amount of mixture dropped into cold water forms a very soft ball. Remove from fire, add butter and vanilla, cook to lukewarm, then beat until mixture begins to thicken and loses its gloss. Pour at once into a greased pan about 8 by 4 inches. When cold, cut in squares. 1/2 cup of broken nutmeats may be added just before pouring into the pan. 6 ounces evaporated milk (2/3 cup), 1-2/3 cups sugar, 1/4 teaspoon salt, 1-1/2 cups diced marshmallows, 1-1/2 cups chocolate chips, 1 teaspoon vanilla, 1/2 cup chopped nuts. Mix milk, sugar, and salt in saucepan over low heat, and bring to boil. Boil 5 minutes, stirring constantly. Remove from heat, add marshmallows, chocolate chips, vanilla, and nuts, and stir until marshmallows melt and blend in. Pour into buttered 9-inch square pan. Cool, then cut into squares. Makes about 2 pounds. Two cups sugar, one cup milk, one-half cup cocoa; butter one-half size of an egg. Boil until it strings, without stirring, then add one teaspoon vanilla. Beat until almost hard. Cover the bottom of a greased tin with walnut meats and pour mixture over this. Mark off in squares. Two cups granulated sugar, one cup of milk, one-half cup chocolate, butter size of walnut. Boil fifteen minutes, stirring all the time. Then remove from stove and stir until it begins to grain. Flavor with vanilla. 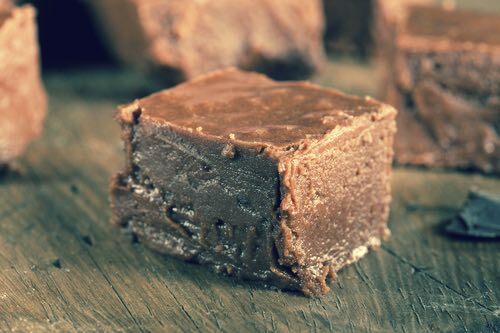 The simple recipe for Vassar Fudge is thought to have originated with Emelyn Battersby Hartridge who was once a student at Vassar College in Poughkeepsie, New York. She made thirty pounds of fudge for the Vassar College Senior Auction in 1886, and its popularity spread to other schools resulting in numerous versions of her original recipe. Cook three cups sugar, one cup milk, and one tablespoon butter. When sugar is melted add six or seven tablespoons cocoa. Stir and boil fifteen minutes. Take from fire, add one teaspoon vanilla, stir till creamy, pour on buttered plates, cut in squares. Four cups brown sugar, one-half cup butter, one-fourth cake (square) Baker's Chocolate broken in pieces; one cup hot water. Boil until it will harden in water; then beat for five minutes, pour in greased pans; cut in squares. Put into your granite saucepan 2 tablespoonfuls of butter, 1 cupful light-brown cane sugar, 1/2 cupful of milk, 2 cupfuls New Orleans molasses, and 4 squares grated chocolate. Put over fire and stir continually until it will form a rather hard ball when tested in cold water. Add a teaspoon of vanilla, turn on greased platter, and let cool; then mark into squares. Two squares of chocolate, 3 cups of sugar, butter size of a small egg, 2-1/2 cups of milk. Boil until it forms a waxy ball when dropped in cold water. Pour on platter, stir vigorously before it cools, till the grain is very fine, and then cut into squares. —Mrs. J. S. Talcott, Tustin, Cal. Take 3 cups granulated sugar, 1 cup of milk, 2 squares of chocolate, a small piece of butter, or not, just as you prefer; let these boil for exactly 11 minutes. Flavoring: If peanuts are added, they should be chopped and put into the syrup just as it is removed from the fire. Fudges must be stirred constantly, and when removed from the fire be beaten briskly until they begin to harden; then spread on buttered platter, cut into small squares, and let get cold. Three cups granulated sugar, 1 cup sweet milk, 1 square grated Baker's® chocolate, 1 tablespoonful butter, cook until it will form a ball by testing in cold water. A peek at fudge history reveals it being invented in America back in the 1890s. By the turn of the century, fudge-making parties became the weekend highlight for children of all ages. Cookery experts began to publish their best recipes for making fudge in all the popular family magazines and weekly newspapers, and homemakers proudly served their fudge at social functions. Everybody was learning how to make fudge with chocolate and nuts being the favorite ingredients added. It wasn't long before a picnic or an evening's game of cards never seemed right unless there was a plateful of warm, freshly made fudge candy available to munch on. 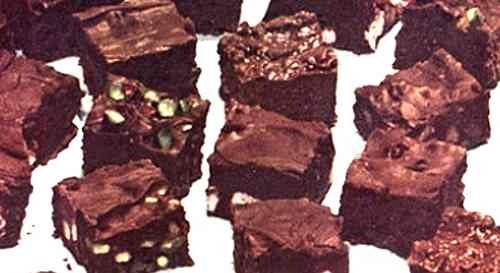 Now, with the help of these easy chocolate fudge recipes, you can enjoy this classic candy anytime.